The University of Auckland Business School has Triple Crown accreditation from AACSB International, EFMD-EQUIS and AMBA. Only 1% of business schools worldwide have this Triple Crown endorsement, so it puts us among a select group of institutions globally. It means the Business School is benchmarked against the best in the world. 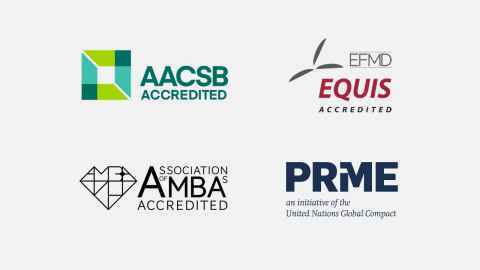 The three accreditations - AACSB International, EFMD-EQUIS and AMBA - are awarded as a result of rigorous quality assessment processes. This Triple Crown is our students' assurance that the University of Auckland Business School provides programmes of the highest quality and meets the highest international standards. Founded in 1919, AACSB International is the largest global community of business schools and corporations dedicated to enhancing management education. It represents the highest standard of achievement for business schools worldwide. By earning this accreditation, the Business School has confirmed our commitment to quality and continuous improvement through a rigorous and comprehensive peer review. EQUIS is the quality assurance system run by the European Foundation for Management Development (EFMD). It is the leading international system of quality assessment, improvement and accreditation of higher education institutions in management and business administration. Its fundamental objective is to raise the standard of management education worldwide. By achieving this accreditation, the Business School has demonstrated not only high general quality in all of our activities but also a high degree of internationalisation. AMBA is the international impartial authority on postgraduate business education - an international brand recognised as the quality mark for the MBA and its awarding institution. Its assessment of MBA programmes takes account of not only the programme but also the institution offering the programme. To achieve this accreditation, the Business School demonstrated a high-quality teaching team as evidenced by relevant management research, scholarship and consultancy.